It was not until we read in our guidebook those dramatic words: “Paro airport is often described as the scariest airstrip in the world” that we came to realise of the importance of the flight ahead of us. Our experience in Nepal had been so satisfying and fulfilling, that we did not have our minds set on Bhutan quite yet. 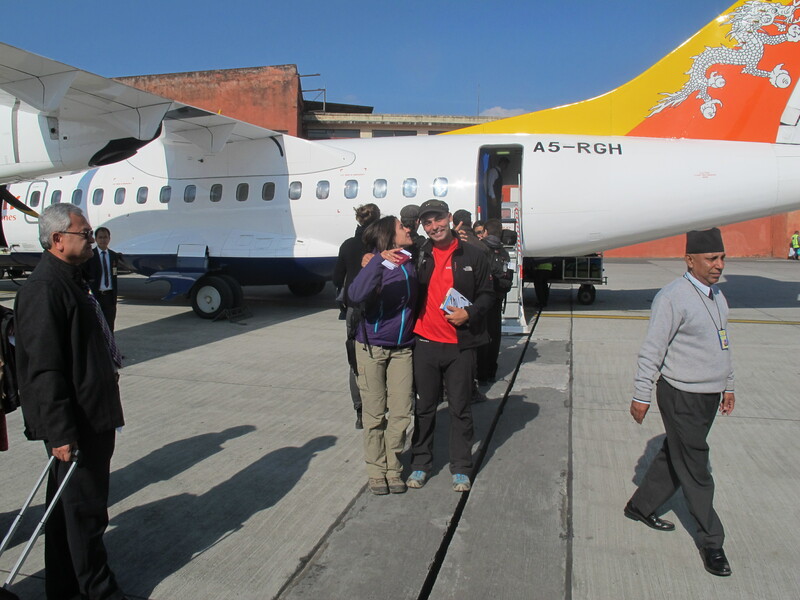 And the flight Kathmandu – Paro was certainly one of the highlights. This flight is considered to be the most spectacular commercial scheduled flight and it would not disappoint anybody. The weather was relatively clear in Kathmandu, what does not necessarily mean that the mountains would be clear too. In fact, there was what appeared to be a thick layer of clouds to the North, bringing our hopes down for the trip. It was a tiny plane and we were no more than 20 people inside it. Everybody was willing to get a seat on the left hand side, although the thick layer of clouds did not allowed us to know whether the visibility would be good. 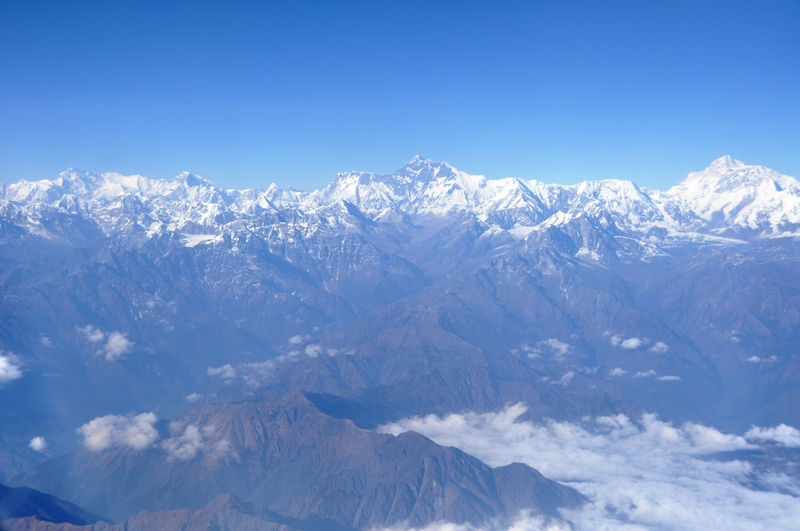 And then, once over the clouds…the most dramatic view of the Himalayas we could ever imagine! We could not believe our eyes! Away from the city, the weather was perfectly clear and the whole Himalaya range was visible from peak to toe. After a few minutes, everybody started asking “is that one over there?”…”is it? ?” And yet! There it was! The highest peak in Earth! The top of the world! Mister Everest: 8850 m (as DTU announced a few days ago in the main Nepalese newspaper). It was just a dark black pyramid that made Lhotse (8516 m), look like a picnic. The feelings are too many to be described: the joy, the excitement…we just feel like in case the plane fell down at that moment, it would just do not matter…We just saw Everest! And we felt that we could even touch it! Even the captain announced it by the P.A. system: “Ladies and gentlemen, welcome to this flight Kathmandu – Paro, at your left you can see Mt. 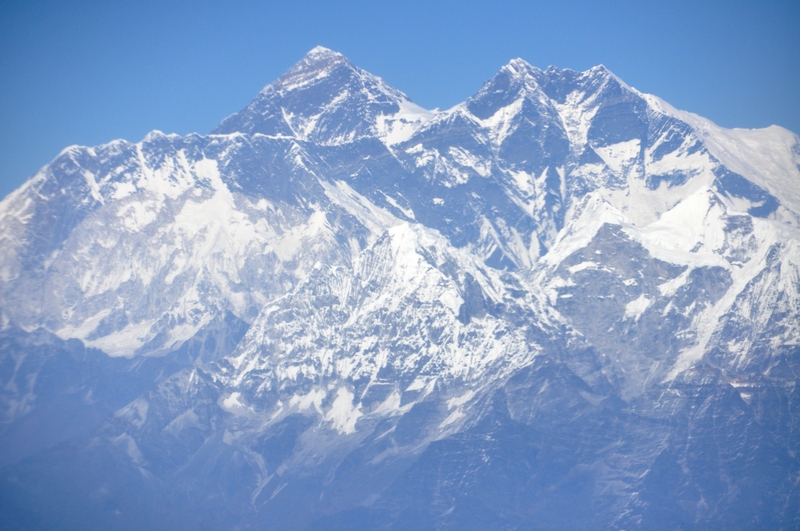 Everest…Enjoy your flight! But the flight has a long list of highlights and views of other peaks almost as impressive: Makalu, Kanchenchunga and other 8000+ peaks that just look almost unreal, so close of the plane as they were. 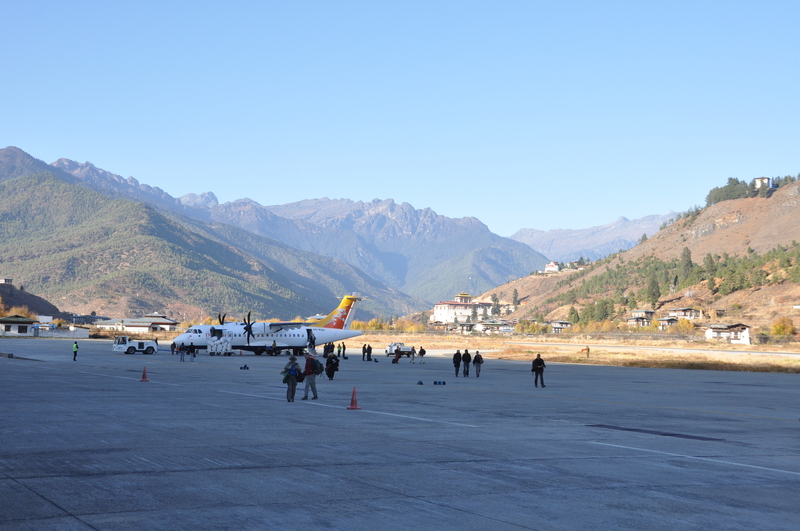 And to top it all, the last surprise of the trip: landing at Paro airport!! It was indeed scary and shocking! For those of us who are used to flying, saying that landing at Paro is simply unconventional would not be fair. The Druk’s plane started a fast and steep descent into the valley, manoeuvring above the thick forests, and still far from the airstrip. We were literally flying through the valley until we reached the safety of the airport. We were very excited, after having enjoyed the ride of a lifetime! Coming soon: a long post about our fantastic week in Bhutan! Muchas gracias Mayte! Nos dió mucha pena que al final no pudieras venir a Madrid, pero nos alegra de que te estén gustando nuestras aventuras por medio de este blog. Te mandamos un besazo enorme y esperamos poder verte a la vuelta! Madre mía chicos, es imposible no sentir envidia sana al leer vuestras aventuras. Deberíais plantearos escribir un libro porque es increible cómo desarrolláis las tramas. Por un momento parecía que yo mismo estaba cogiendo ese vuelo por el Himalaya. Bueno, a disfrutar del segundo país de vuestra ruta. Por cierto, pude descargar todos los packs de fotos de la primera tanda, así que por este lado del mundo están a salvo. Voy a intentar leer las entradas que tengo pendientes, que no he podido leerlas todas, pero seguro que me emocionan tanto o más que esta. Os quiero mucho a los dos. I can understand your feelings perfectly!!!! I imagine how excitement you felt as close of this natural marveluos. One word… SPECTACULAR!!! !